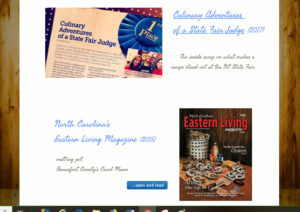 Published in Carolina Country Magazine… January 2018. As I sit here on this really cold day, watching stories from temps in the midwest United States colder than Antarctica with records being broken, this salad came to mind. I created it for January 2018 issue of Carolina Country magazine… when citrus fruits are plentiful. 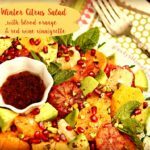 Sure to break through the winter doldrums, this vibrant salad, both in taste and color, will break the monotony of heavy winter comfort foods, and offer a reminder of warm spring and summer days ahead. 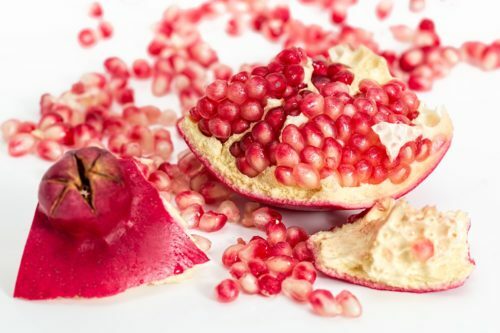 Getting the arils (seeds) out of a pomegranate are not as challenging as one might think. Don’t let that keep you from enjoying these tasty fruits. They are most plentiful and in season from November into the early part of the year. 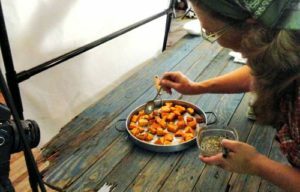 Here are a couple of ways to get those crunchy little nuggets out in just a minute or two. When buying… look for smooth-skinned fruits that feel “heavy.” That means more juicy arils tucked inside! They will keep for weeks in the refrigerator, and can even be frozen. 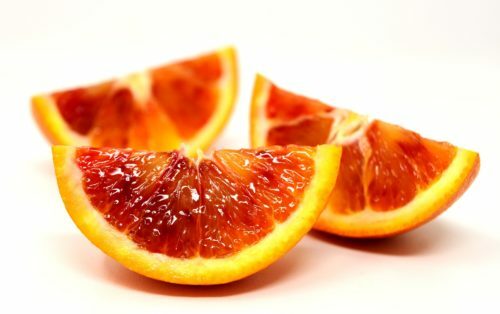 The blood orange is a variety of orange with crimson, almost blood-colored flesh. The distinctive dark flesh color is due to the presence of anthocyanins, a family of antioxidant pigments common to many flowers and fruit, but uncommon in citrus fruits. Chrysanthemin is the main compound found in red oranges. The skin of blood oranges may be darker orange and “blood” toned like the flesh. It tends to be thicker also. The flavor of a blood orange is different than your usual orange… some say it has raspberry undertones. I don’t find that to be the case (I don’t care for raspberries but love blood oranges). Due to growing conditions necessary for them, you will not find them year round. Their season is from December to early spring. 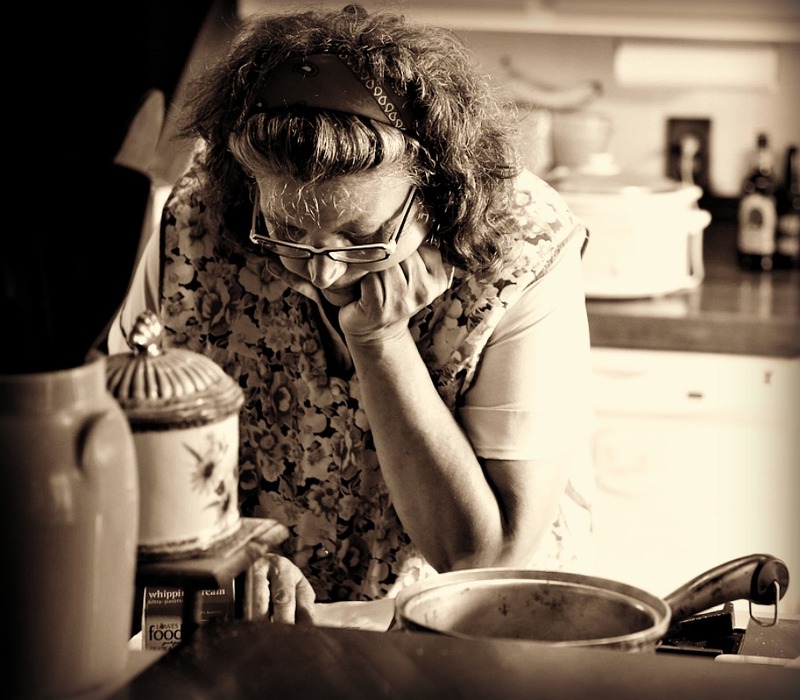 When buying, look for those that feel “heavy.” Stay away from those that feel spongy. They can be stored a couple of weeks in the refrigerator. Use to spiff up winter salads or enjoy as is. Blood oranges have some great medicinal qualities too. Just google to read from trusted sources. 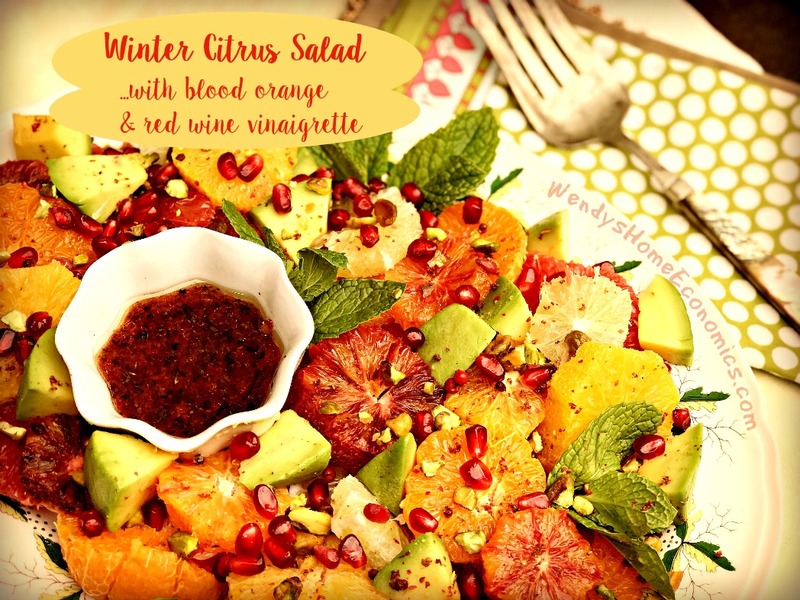 Vibrant citrus fruits are plentiful in the dead of winter, and this is a great salad to brighten the dreariest of days. Don’t worry about exact measurements for salad ingredients. Use as much or as little as suits your fancy. Peel the citrus fruits and cut into thin slices, removing any seeds. Place onto platter along with avocado. Garnish with pomegranate seeds, nuts, pepper and sprigs of mint. Put all ingredients in jar with lid and shake to blend. Best if made at least one hour ahead. Drop by my facebook community too!